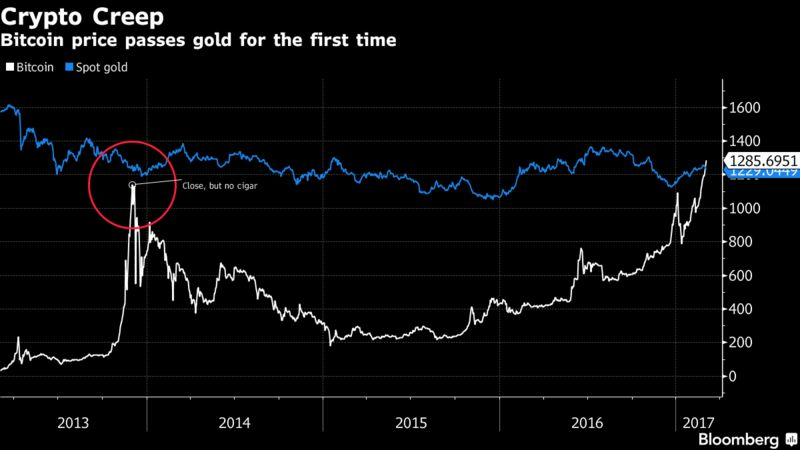 Bitcoin jumped to a new high Friday, a day after soaring past the price of an ounce of gold for the first time. One unit of the virtual currency was trading above $1,292.71 at 7:30 a.m. in New York, compared with $1,226.89 for an ounce of gold. The metal’s had a terrible week, declining for the fourth time in five days. The latest surge in bitcoin’s value has been attributed to tighter currency restrictions in countries such as China, India and Venezuela, as well as speculation about prospects under the Trump administration. Bitcoin still has a lot to prove, John Butler, head of wealth services for GoldMoney, said in an interview. China’s three biggest Bitcoin exchanges suspended withdrawals last month after pressure from the People’s Bank of China, which was concerned people were using bitcoin to move money out of the country, sidestepping official efforts to shore up the yuan. Investors may also be betting on a more relaxed regulatory environment under U.S. President Donald Trump. The U.S. Securities and Exchange Commission is expected to rule on a proposal for an exchange-traded fund based on the digital currency by March 11. “Some people may be frontrunning what they see as the ETF demand down the road,” Butler said. In January, the volatile cryptocurrency passed its 2013 peak of $1,137. After the previous peak, it fell 53 percent in less than a month.